If you've ever met a toddler, you know that "why" is one word they seem to master early. For Britches the parrot, his word is "really." He humorously uses his favorite word to question his owner's seemingly unreasonable request that he stop eating her camera! Despite repeated assurances that eating the camera is a bad idea, Britches takes a few taps on the camera and even laughs when told, "That's not funny!" 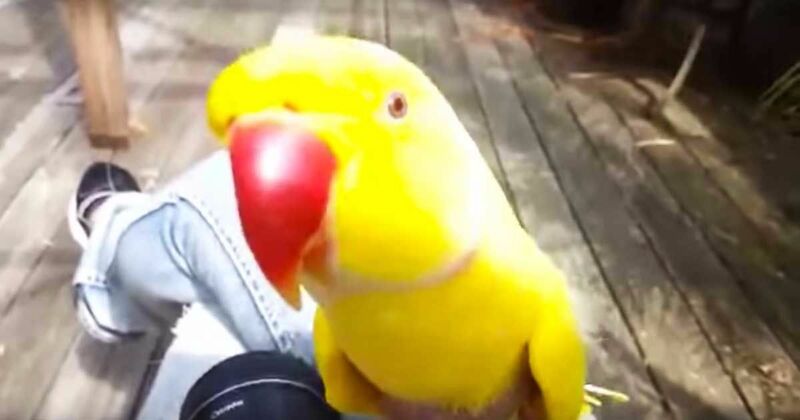 Check out the video to see the sweet bird's funny response. Britches, an Indian Ringneck Parakeet, is a rescue bird who now has a family to call his own. You can check out his adventures on the Britches and Friends Facebook page. Indian Ringneck Parakeets usually live a long life, around 25 years, and are native to Asia and Africa. These birds have very friendly personalities, but they need a lot of love and attention to keep their attitudes in check! Doesn't this bird remind you of a curious toddler? Check out the video above and don't forget to share this with your friends and family on Facebook.